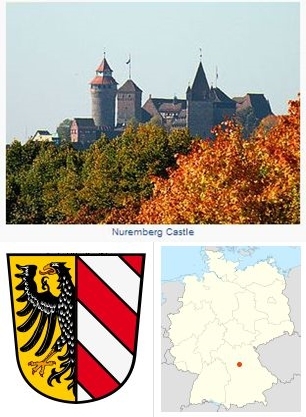 Nürnberg (Nuremberg), a former free city (population in 1950, 360,017; in 2006, 500,000; coordinates: 49.45, 11.083333 [49° 27′ 0″ N, 11° 5′ 0″ E]) is located in Middle Franconia, Bavaria, Germany. In the Reformation period the city played an important role. It was the center of intellectual life. Great scholars like Willibald Pirkheimer, great painters like Albrecht Dürer, and great poets like Hans Sachs lived and worked here. The Reformation found early entry into the city, with the preachers Andreas Osiander and Lazarus Spengler as its most important representatives. The imperial diet met here twice, in 1522 and 1524. The most important historical event to take place here was the Peace of Nürnberg of 1532. Signs of Anabaptism appeared here very early. It is possible that Diepold of Thon, near Nürnberg, a peasant who was holding religious meetings in February 1524 in the neighborhood of Nürnberg with a large attendance, which were forbidden him, and Gallus, a journeyman weaver of Nördlingen, who fared similarly on 6 May 1524, were forerunners of the new movement. For it is known that at the beginning of the Reformation there were Waldensians in and around Nürnberg. Meanwhile Hans Denck had come to Nürnberg in the fall of 1523. After serving for a year as rector of the school of St. Sebald, he became involved in a theological dispute with Osiander, and was expelled from the city on 20 January 1525. Here in Nürnberg he met Ludwig Haetzer, Hans Hut, and Hans Schlaffer. Hans Hut was working for a book binder named Valantin, and lived in Denck's house at various times. Later, in 1526, after he had been baptized as an Anabaptist at Augsburg by Denck, Hut won Wolfgang Vogel, the pastor at Eltersdorf near Nurnberg, for Anabaptism. The city council of Nürnberg ordered Vogel's execution on 26 March 1527, as a seditious person, because he "sought to form an association for the elimination of all the ungodly and establish a new kingdom of Christ, where only equality is to reign." In 1526 Prince Casimir of Brandenburg issued a proclamation to his subjects in Nürnberg warning them of the "adherents of the malicious company, who held nothing at all of the original baptism of infants, nor of the sacrament of the altar, and supposed that in a short time Christ would return and begin a temporal reign, and that the sword of righteousness (as they called it) would be placed in their hands to destroy and kill all authority and those that did not accept their rebaptism and were not related to their fellowship, also that there is no eternal punishment in sight for the damned and the devil will be saved, together with other improprieties." The council was also zealous in warning against the Anabaptists. On 21 March 1527 it wrote in a letter to the city of Strasbourg in reply to a question about the Nürnberg church constitution, that in all the towns and villages of the area Christian evangelical preachers had been installed, who had previously been tried and examined as to their possible contamination with Anabaptism, for the Anabaptists believed that Christ was only a man, that He was begotten in sin, that He had not done satisfaction for the sins of mankind, that no Christian could be a ruler, that God will return in person to the earth to establish a physical reign in which all government will be destroyed, and all things should be held in common. No Anabaptist was to be tolerated in the city, because the sect is especially inclined to sedition. In addition, the council forbade the printing, sale, or possession of the booklets of these teachers of false doctrine. In a similar vein the council had three days previously written to the city of Regensburg, mentioning Hans Hut and giving an exact description of him, and on 26 March likewise to the Elector of Brandenburg. The Nürnberg council was constantly on the alert to counter Anabaptism. On 11 September 1527 it sent George Grün to Erlangen to attend the examination of the imprisoned Ambrosius Spittelmaier. On the next day it sent a letter to the city of Ansbach asking for information about Spittelmaier, so that Nürnberg would be able to help in exterminating this "ungodly and misleading faction," and enclosed 35 questions which Spittelmaier answered in his examination on 20 September 1527. On 23 September 1527 another letter was sent to Ansbach, with the intention of "exterminating the poisonous new sect of the Anabaptists with zeal." The letter continued that there would be no purpose in sending to Ansbach the court records of the Anabaptists in prison in Nürnberg, since they were poor peasants who had themselves not baptized but were misled. From Augsburg they had received news that Hans Hut, the leader of the Anabaptists, had been imprisoned, and that they should examine Spittelmaier, who said he was an emissary of Hut, on the enclosed questions. Again on 21 December 1527 Nürnberg wrote a letter to Ulm containing the same unfounded accusations against the Anabaptists as those written to Strasbourg and Regensburg. At the same time the council had a work published with the title Grundtliche vntterrichtung eins erbarn Rats der Statt Nürnberg Welcher gestalt jre Pfarrher vn Prediger in den Stetten vn auff dem Land das volk wider etliche verfürische lere der Widertauffer in jren predigen auss heyliger Götlicher schrifft zum getreulichsten ermanen vnnd unterrichten sollen. It contains 42 pages. The author is unknown. It obviously stems from Lutheran circles in Nürnberg, for it contains strictly Lutheran teaching. It was published in 1528 or later, for Hans Hut's death in Augsburg is mentioned in it. The introduction to the book reproduced the current accusations against the Anabaptists, charging them with fomenting revolt and sedition. "The evil, devilish poison must be counteracted with state measures and also especially with instruction on the basis of the Word of God." This is followed by a profusely verbose instruction on baptism, based largely on the Old Testament. Then comes a presentation of Anabaptist teaching in twelve points. Point 8: "They say no preacher shall stay in one place but travel about as the apostles did." Point 11: "But some say there is no devil but sin and evil desire and inclination of man." Then these twelve points are refuted, again largely on the basis of the Old Testament. The argument is often picayune and anything but convincing. This booklet shows not an iota of understanding of the Anabaptists, but apparently contributed considerably to the struggle against them. On 25 January 1528 the council of Nürnberg requested of the council of Regensburg the names of the Anabaptists living there or being held in their prison. Upon inquiry by Dr. Hiltner, the legal adviser of the city of Regensburg in 1530, as to the measures to be adopted in the case of Anabaptists, Nürnberg gave a circumstantial reply describing the procedure within its jurisdiction. When the captains of the Swabian League received the command in February 1528 to put to death without trial all who were suspected of Anabaptism, the council of Nürnberg protested and proposed milder measures, probably for fear that innocent persons might become victims of these severe measures. Nonetheless it is significant that Nürnberg never again sponsored the death penalty for Anabaptism after the case of Vogel. In May 1528 six Anabaptists were in the Nürnberg prison. They were visited by Dr. Wenzeslaus Linck and the pastor of St. Clara's Church, who instructed them in Lutheran doctrine. Several Anabaptist expellees from Augsburg who had come to Nürnberg were conducted out of the city on 16 May 1528 by two city soldiers and were compelled to swear that they would never enter the city again. In July 1528 the city council demanded advice from its lawyers and theologians on the proper punishment of Anabaptists. The jurists met on 8 July; three favored the death penalty and three opposed it. Of the theologians, Dominicus Sleupner and Wenzeslaus Linck voted against the death penalty, and Osiander for it. Cartheuser made the decision the duty of the council. This official opinion was given twice. Then on 14 July 1528 the Nürnberg city council issued an edict: "All who recant their error of Anabaptism shall be accepted in mercy; those who persist in it shall be expelled beyond a distance of ten miles from the city." In January 1529, 20 persons of both sexes were arrested in the country because they had been rebaptized. Thereupon the council on 25 January 1529, for the third time, asked the official opinion of the jurists and the theologians. The reply was to the effect that "since this error was on the increase, punishment should reasonably follow. In addition it might be advisable to issue another mandate ordering that anyone who was rebaptized should have his eyes put out." The twenty arrested Anabaptists not only adhered to their baptism, but also believed that the sacrament did not contain the actual body and blood of Christ; the council then had them given instruction. Those who were converted were left in peace; those who persisted were expelled, contrary to the advice of the clergy and lawyers who wanted more severe penalties; the Anabaptists had to give an oath that they would not again come near the city. On 29 April 1531 the Nürnberg scholars rendered another official opinion. This time the theologians took a lenient and generous position, and only some of the jurists favored the death penalty. A noteworthy event was the result of the consultation of 30 May 1531, concerning the "dreamers of Windsheim," also called "Puschenhamer." "It is difficult to proceed against them; one does not know whether they may simply have been misled. In this case, if the man in question were in Nürnberg's jurisdiction, he would be expelled from the city. They, however, would leave the decision to the prince." The opinion of the jurists and theologians in the case of the Anabaptists of Baiersdorf (Uttenreuth) issued on 3 June 1531 had a different tone, "It is above all necessary, useful, and fruitful, first of, all to institute a church constitution in the margravure." These Schwärmer shall be overcome by the Word of God, taught and indoctrinated. But they must be released without punishment because, as the example of Müntzer has shown, they are intent upon the destruction of the government. They must therefore not be permitted to gain the upper hand. The originator, Hans Schmid, shall be burned at the stake, the others killed with the sword. But those who are amenable to teaching shall be branded. Above all, the prince is to issue a severe edict. In April 1535, when it was learned that some were holding a "synagogue" behind St. Jacob's Church, the council had them arrested. The Anabaptists from Carinthia, who were staying at the inn "To the White Rooster" at St. Lorenz, were ordered to leave the city at once. The innkeeper was warned against admitting such guests and ordered to notify the authorities at once if any arrived. Peter Riedemann was imprisoned in Nürnberg for four years and ten weeks (1532-19 July 1537) in the tower called "Lug ins Land." Osiander and other theologians tried in vain to convert him. In 1536 the council had a whole Bible brought to him with Melanchthon's booklet on baptism, but in vain. In the cross-examination of 30 January 1539 Jakob Holin of Schorndorf named a Konrad Hefner of Nürnberg as leader of the Anabaptists; nothing else is known about him. During Mosheim's residence in Nürnberg two Anabaptists appeared there on 9 October 1539; they had been imprisoned at Passau and released. The Nürnberg city council had some clergymen examine them on their doctrine, and when they were convinced that these men had repudiated Anabaptist doctrine they were released with the warning not to spread Anabaptist teachings. In March 1541 the Anabaptists in Nürnberg ventured to come into the light. The council, informed of this matter, had them all arrested. The tailor Lorenz Holzmann, whom three theologians tried to convert, persisted in his Anabaptist ideas and refused to recant. Thereupon the council made him pay the trial fee, swear not to return within a radius of ten miles of the city, and ordered him expelled. On 19 April he was to be led from the city, so that he would not mislead his wife and other people or persuade them to such error. When this sentence was read to Holzmann he asked for the council's permission to appear with his wife before Master Vetter, the preacher of St. Sebald, to discuss the matter with him. This permission was granted, and Vetter succeeded in converting him from his error. Holzmann was then pardoned, but penalized by having to stand on two Sundays before the church with his wife. Heinrich Meilendorfer, another Anabaptist, was punished with four weeks in prison; his wife, who had led him into this error, was forged to a "bench and irons" for four weeks. Others were treated more leniently. Thus Anabaptism was suppressed in Nürnberg. But traces continued to appear for a long time to come. Since 1948 there has been a small Mennonite congregation at Nürnberg, numbering 25 baptized members in 1956. It had no meetinghouse and was served by ministers from the outside. Beiträge zur bayrischen Kirchengeschichte 10 (1913): 57 ff. Evans, Austin Patterson. An Episode in the Struggle for Religious Freedom, The Sectaries of Nuremberg 1524-1528. New York, 1924. Grundtliche untterrichtung, eins erbarn Rats der Statt Nürnberg, Welcher gestalt, ire Pfarrher vn Prediger in den Stetten un auff dem Land, das volck, wider etliche verfürische lere der Widertauffer, in fren predigen ausz heyligerr Gotlicher schrifft, zum getreulichste ermannen vnnd vnterrichten sollen. Nürnberg, 1527-28. Heberle, Joh. "Johann Denk find die Ausbreitung seiner Lehre." Theologische Studien und Kritiken (1855): 817-890. Hege, Christian and Christian Neff. Mennonitisches Lexikon, 4 vols. Frankfurt & Weierhof: Hege; Karlsruhe: Schneider, 1913-1967: v. III, 279-281. Hist. Ver.-Blatt für Schwaben und Neuburg (1874). Nestler, Hermann. Die Wiedertäuferbewegung in Regensburg. Regensburg, 1926. Roth, Friedrich. Die Einführung der Reformation in Nürnberg. Würzburg, 1885. Soden, Franz von. Beitrage zur Geschichte der Reformation und der Sitten jener Zeit mit besonderem Hinblick auf Christoph Scheurl II. Nürnberg. 1885. Wiswedel, Wilhelm. Bilder and Führergestalten aus dem Täufertum, 3 vols. Kassel: J.G. Oncken Verlag, 1928-1952: v. II. Neff, Christian. "Nürnberg (Freistaat Bayern, Germany)." Global Anabaptist Mennonite Encyclopedia Online. 1957. Web. 19 Apr 2019. http://gameo.org/index.php?title=N%C3%BCrnberg_(Freistaat_Bayern,_Germany)&oldid=145950. Neff, Christian. (1957). Nürnberg (Freistaat Bayern, Germany). Global Anabaptist Mennonite Encyclopedia Online. Retrieved 19 April 2019, from http://gameo.org/index.php?title=N%C3%BCrnberg_(Freistaat_Bayern,_Germany)&oldid=145950. Adapted by permission of Herald Press, Harrisonburg, Virginia, from Mennonite Encyclopedia, Vol. 3, pp. 926-928. All rights reserved.